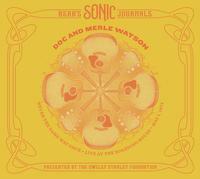 Previously-unreleased live recordings of Doc and Merle Watson from the archive of legendary soundman and counter-culture icon Owsley Stanley. Audiophile production, mastered from the original archive tapes by Owsley’s hand-picked engineer, Jeffrey Norman, and re-clocked by Plangent Processes to remove timing distortions. · Doc Watson was an American guitarist, songwriter and singer of bluegrass, folk, country, blues and gospel music, who won 7 Grammys, and a Grammy Lifetime Achievement Award. · Owsley Stanley, the soundman for The Grateful Dead, was the father of the modern rock and roll concert sound system. · This is the first release by the Owsley Stanley Foundation from Bear’s Sonic Journals, Owsley’s storied trove of 1300+ live concert recordings from the 1960s and 1970s, including recordings by Miles Davis, Johnny Cash, The Grateful Dead, Jefferson Airplane, Fleetwood Mac, Janis Joplin, and more than 80 other diverse artists and idioms. · Liner notes include a new interview with bassist T. Michael Coleman, an essay by Starfinder Stanley, son of Owsley Stanley, and original artwork by Mike DuBois.